If you are using earphones, Digit-Eyes voicing is perceptible only to you! Since Bill lost his vision, he hasn't been able to play cards with his friends, something he'd always enjoyed. He plays bridge and poker on the Internet, but sitting at a computer competing against strangers just isn't the same as trumping the couple next door or enjoying an evening with the guys. Bill decides that Digit-Eyes can get him back into the swing of things! 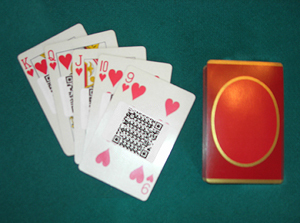 Bill uses the Digit-Eyes feature for text labeling to create 52 labels -- each with the name of one of the cards: 'Ace of Clubs', '2 of clubs', etc. Using conventional decks of cards and the help of a friend, he puts the correct Digit-Eyes label on each card. Both the Digit-Eyes labels and the notation on the cards are evident, but only he will be able to read the Digit-Eyes labels. Because the labels are centered on the cards, the decks are scarcely thicker and still easy to shuffle. Bill lays in a stock of snacks, chills a few brews and invites the guys over for a "friendly game". When his friends show up, he explains the labels on the cards, brings out his phone and the fun begins! He and his buddies have a great evening -- just like old times -- and Digit-Eyes has done its job!